Accommodations: 71 rooms including standard view, ocean view, ocean front, and ocean front suites. Price Includes: Includes 7 nights standard room accommodations at Fort Young Hotel, airport transfers, welcome rum punch, full breakfast daily, 5 days of 2-tank boat dives, government taxes and service charges. After checking in at the front desk you will be escorted to either a cozy Standard Room, a comfortable Fort Room, the deluxe Oceanfront Room or the luxurious Oceanfront Suite. Oceanfront Rooms each have a private balcony with a superb view of the ocean. Complimentary high speed internet access is exclusively available in this room category. All Rooms have private bathrooms with private balconies, air conditioning, ceiling fan, a writing desk, cable TV, and direct dial telephones. 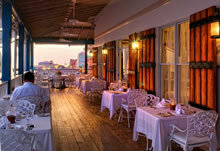 Savor the International and Creole Style food on the Waterfront. Or, start your morning with our locally made freshly brewed, coffee and a wide selection from our breakfast buffet with made to order omelets or eggs done to style and taste. Buffet lunches are prepared during the week with a different theme each day: Monday – East Indian, Tuesday – Italian, Wednesday – Caribbean, Thursday – Oriental, and Friday – a medley of seafood. Barbecue night every Monday – a delectable choice of barbecue fare served on our Terrace. Live steel Band entertainment. Conveniently located close to the Waterfront restaurant, the tropical waterfall and the Hotel’s shopping complex, this bar is open from 10am – 6pm on Cruise Ship Days and offers a variety of tropical drinks along a boardwalk overlooking the Caribbean Sea coastline. The Balas lounge bar is noted for its exotic island cocktails and potent Rum and features the island’s best Friday Night happy hour from 6:00- 8:00 pm. Check out the variety of grilled snack items & Live Band. Relax and enjoy the beautiful scenery on Dominica’s many miles of hiking trails. An intricate network of hiking trails, designed for all types and ages provides natural excitement. All you need are suitable hiking shoes and comfortable clothes. If hiking doesn’t float your boat, you have other activities include whale watching, kayaking, river tubing, bird watching, visiting several local waterfalls, or a rainforest tours. You can even ride a rainforest tram! 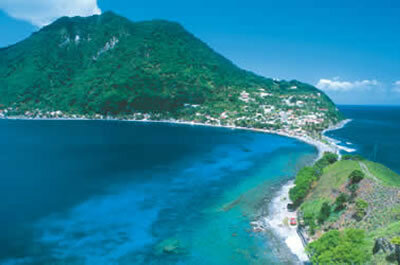 Born a fiery volcanic island, the Scottshead Soufriere Marine Reserve’s 19 dive sites each offer a different experience. 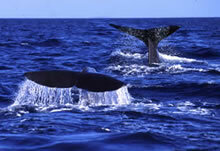 Jump in and enter Dominica’s is to 200 fish, 28 species of hard coral, and 10 species of soft. 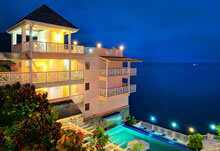 Fort Young Hotel works closely with Dive Dominica to ensure that all your diving needs are met. Rest assured that if you forget something at home and need to rent equipment, or if you need something repaired, you are in good hands. What to learn to Dive? Dive Dominica’s the knowledgeable and talented instructors are happy to oblige. Or, if you are just looking for a guide to show you where the seahorses or frogfish live, they can do that too. Your dive boat will seat between ten and thirty divers respectively and will get you to and from the 19 dive sites in the Reserve. 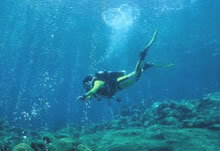 Non-divers and snorkelers are allowed on the boat for an additional $10, plus tax. Boats go out with a minimum of four divers in the morning and six in the afternoon.